Kaléo Pharmaceuticals' Auvi-Q autoinjector costs more than the EpiPen, but is priced far lower in Canada than in the U.S. The American epinephrine autoinjectors ordered by Health Canada as an emergency measure amid an ongoing EpiPen shortage have been priced at $170 Cdn each by manufacturer Kaléo Pharmaceuticals, CBC News has learned. Since 2015, Pfizer Inc. — EpiPen's manufacturer — has been the sole supplier of epinephrine autoinjectors in Canada. They are life-saving devices for people who have an anaphylactic reaction to something they're allergic to, including food, and patients are usually supposed to have more than one of them. Schools, for example, often require that children at risk of anaphylaxis keep an injector in the classroom. 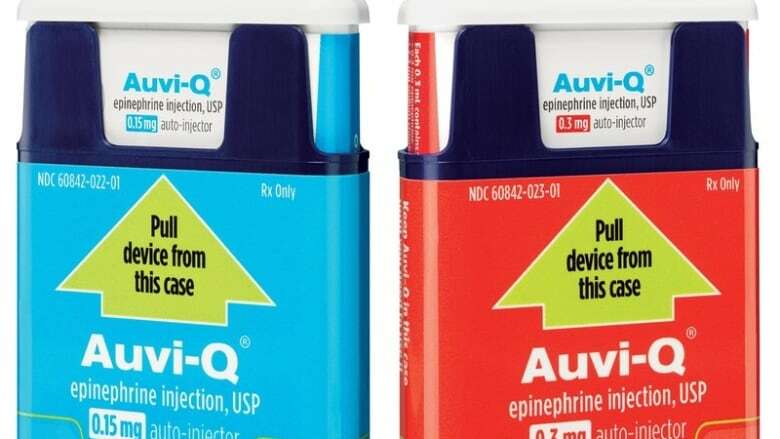 That $170 price for the Auvi-Q epinephrine autoinjector is more than the price of an EpiPen, which costs about $100 before pharmacy dispensing fees, but it's far less than product's retail price in the U.S. of about $460 Cdn. But although that's the amount Kaléo will charge its Canadian distributor, the end cost to patients or their insurers may vary, Herzog said, "depending on insurance coverage by province, pharmacy markups and other factors in the distribution system in Canada." Some Canadians may be familiar with that name: Allerject was previously recalled by Sanofi in October 2015 amid concerns the device could potentially deliver an inaccurate amount of epinephrine. In addition, "enhancements ... have been made to the manufacturing and quality systems that require approval by Canadian authorities," he said. It's not yet clear how much Allerject will cost if it is sold in Canada permanently. The $170 price tag for its Auvi-Q counterpart only applies to the temporary time period set by the health minister's interim order. In an email statement to CBC News in early August, spokesperson Lainie Keller said, "We are actively seeking to bring Emerade (adrenaline tartrate) to patients in Canada who need it as soon as possible." When asked this week if Kaléo's entry into the Canadian market would affect Bausch Health's decision, Keller said, "our comment still stands, and we have nothing new to add at this time." An earlier version of this story said that Allerject was previously manufactured by Sanofi. In fact, Sanofi helped to commercialize and distribute the device in Canada.